More than anything else, Caribbean islands attract adventurers having a penchant for experiencing most exciting and spectacular diving sites. Each island and its diving sites have their own charm. Every diving site has one or the other specialty that includes untouched reefs, underwater caverns, submarine volcanoes and awe-inspiring shipwrecks. Barbados is better known as the “shipwreck capital,” so you can expect a diving experience that takes you very close to some or the other sunken ship. Other than this, you can look forward to derive pleasure watching abundant marine life and extraordinarily beautiful coral arrangements while your scuba diving trip. Bonaire, one of the ABC islands is the smallest and the most untouched of all three. It is the least untouched, which is why it has some of the best diving sites to offer scuba diving enthusiasts. Moreover, its environmentally conscious diving industry contributes a lot to the maintenance of the diving sites. You will love watching yellowhead jawfish and squid down there and several submarine volcanoes. This shipwreck diving site is not real but a created one. A retired cargo ship, Ray of Hope was intentionally made to rest on the bottom back in 2003. A 200-foot freighter allows divers to explore its cabins, cargo hold and gangways. It is an artificial reef and now has become home to many stingrays, groupers and Caribbean reef sharks. A one-stop destination for divers who crave seeing plenty of durgeons, big scrawled filefish, barracuda and stingrays. It appears like a path filled with so many attractive features that leave scuba divers cheerful. Colorful coral and sponge, and tropical fish are also a part of a Green Outhouse Wall scuba diving. If you are lucky enough, you will spot a sea turtle or a spotted eagle ray as well, as they appear only occasionally. 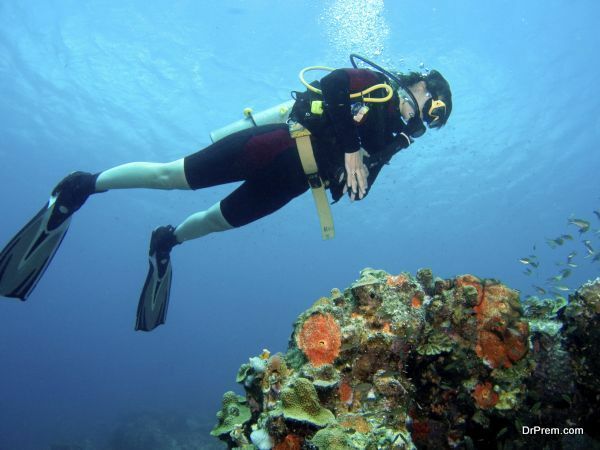 St. Croix being one of the top scuba diving destinations in the Caribbean offers a number of diving options. Ranging from wall dives, reef dives, wreck dives, night dives to beach dives, this site leaves no stone unturned to amaze scuba divers. Caribbean scuba diving sites are famous for offering divers the best of diving environment and numerous exhilarating features. Top – 5- Bachelor Party Locations from across the World! The Best Family Vacation Spots from Across Asia!